These floor model chambers are designed for exhausting dust, harmful vapors and paint fumes. The dry arrestor filters trap the airborne overspray particles before the filtered air is discharged through the exhaust system and into the atmosphere. The chambers are available in a wide range of designs to meet practically any production requirement. 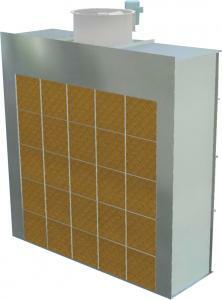 Air replacement units and intake chambers can be added as well as reduced airflows for automatic spray operations. Chambers are constructed from 18-gauge, prime quality, galvanized steel. Structural steel is used to add strength and rigidity to chambers as necessary. Control panel is optional, fire control systems are to be supplied by others. A tubeaxial exhaust fan, designed specifically for use in paint spray exhaust chambers, powers the airflow through the booth and exhaust stack. All exhaust fans are of non-sparking construction. The motor drive and bearings are sealed from the air stream of the exhaust. Open drip proof (ODP) motors are provided with each unit. Explosion-proof motor upgrade is required for flammable painting environments. Exhaust fan with capacity of 8,000 CFM. Furnished with 24” diameter blade, 2HP, 208/230/460V three-phase open drip proof (ODP) motor. Heavy-duty construction bench is fabricated with 18-gauge galvanized steel panels. Promotes shop safety by exhausting harmful vapors and dust thereby reducing health hazards for shop personnel. Explosion-proof motor upgrade is required for flammable painting environments.